So I’ve accidentally planned it so that I’ve done 2 clothes related posts straight after each other but never mind. This week I haven’t worked as many days and in a bid to make myself wear more of my clothes and in different combinations, I decided to do a week in outfits. 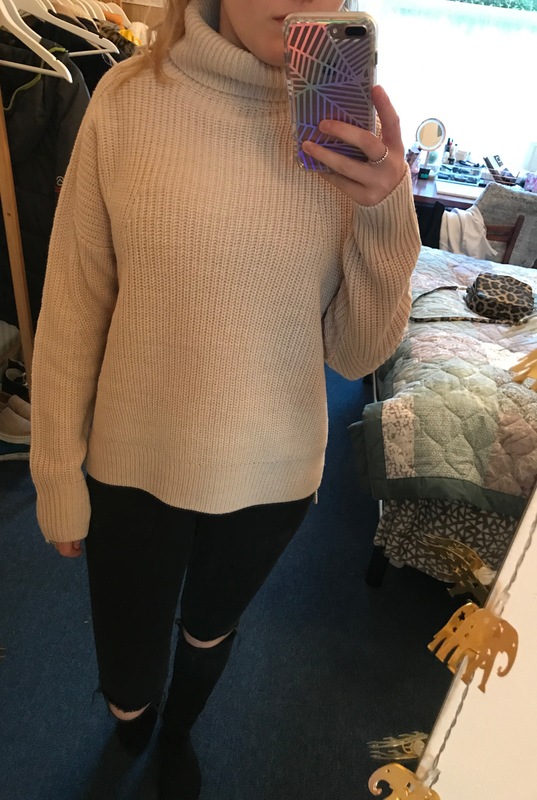 Knowing I was going to be posting my clothes online made me want to dress nicely and not just wear the same old jeans and a jumper every single day. So lets get onto what I’ve been wearing this past week and what for so you can have a cheeky life catch up too and context as to what each outfit was worn for. I will also try and link any items that are still available in stores. On Monday I was just knocking about running errands and chilling, this was when I first noticed the weather had turned cooler and I decided to document the beginning of my Autumnal dressing. 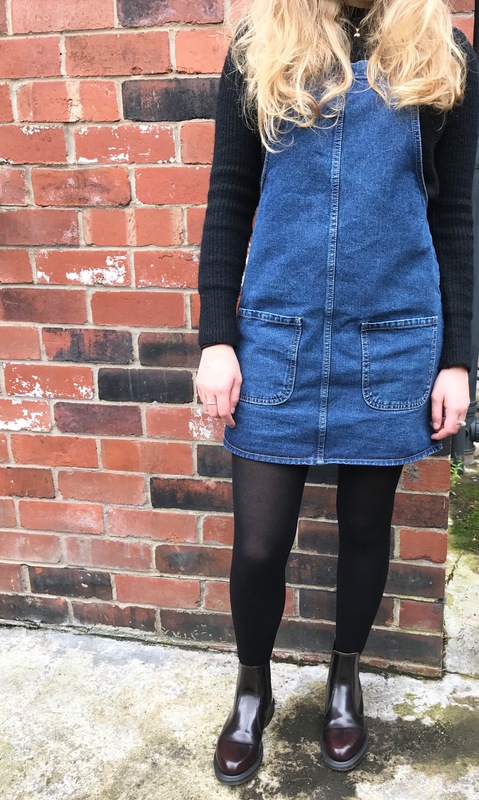 I wore my black Topshop jumper under one of my newer additions, a Primark Dungaree dress which I know I will get loads of wear out of, the temperature called for tights and I finally got to wear my new Dr Marten Flora boots which I absolutely LOVE!!! I was up bright and early for Volunteering on Tuesday, I teamed an old Miss Selfridge navy and white striped t-shirt with my other new purchase from Primark, my black dungarees. 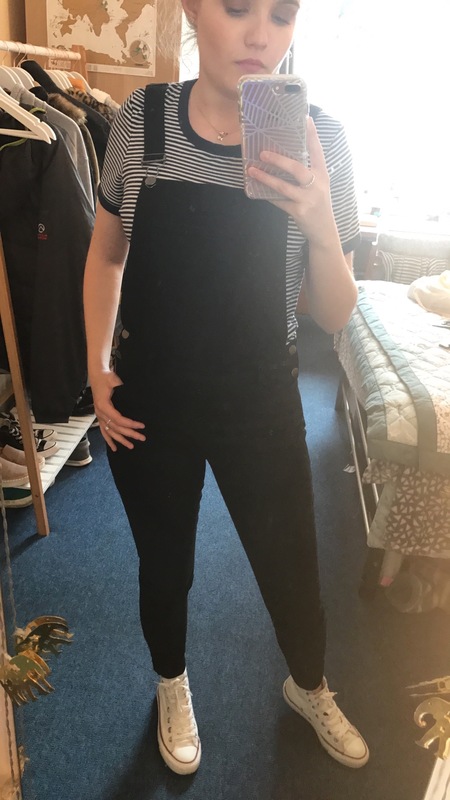 I’ve been after some dungarees for months, having tried loads and never found the right pair, I finally found these after Amy brought some home and I had to copy her. Although I’m trying not to purchase as many unethical fashion pieces, I try to stick to the 30 wear policy if I do stray into fast fashion shops. The idea is to ask yourself if you think you will wear the piece 30 times, if yes then you can buy it, if not leave it. In the case of the dungarees I think it will be a definite yes as they are so comfy and suitable for the colder weather. Finally I threw on my trusty converse and was good to go. 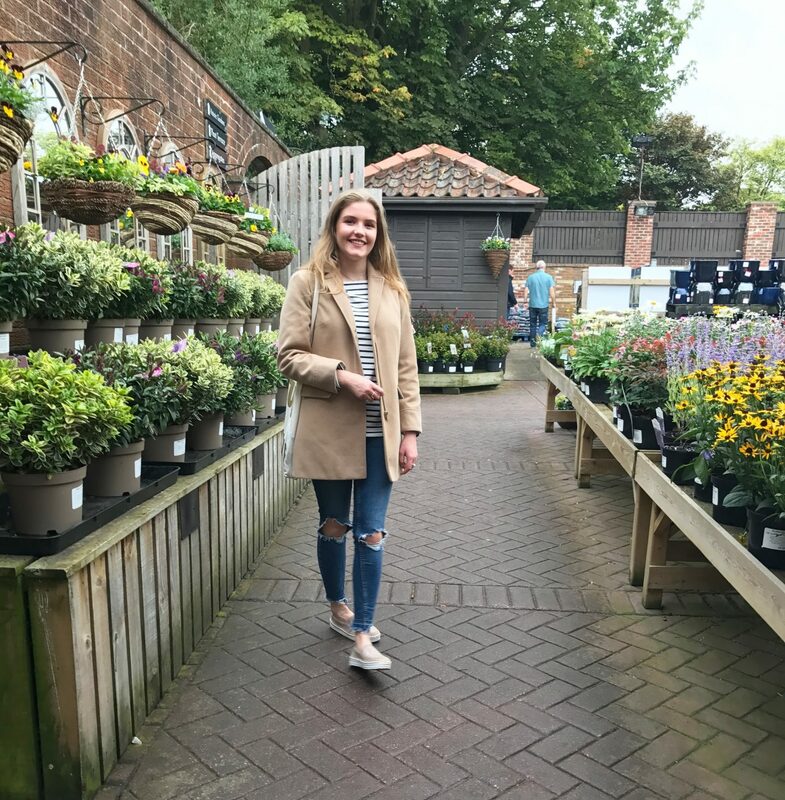 On Wednesday I headed to Meadowhall to pick up a few final pieces to add to my Autumn wardrobe, which I now won’t be adding to until at least December (fingers crossed, see my Autumn Wardrobe post). I went to pick up a striped long sleeve t-shirt, a grey cardigan and some knitwear, I did well at sticking to my list, picking up 2 jumpers, the cardigan and the t-shirt. For my little shop I wore my white Topshop fluted sleeve (???) 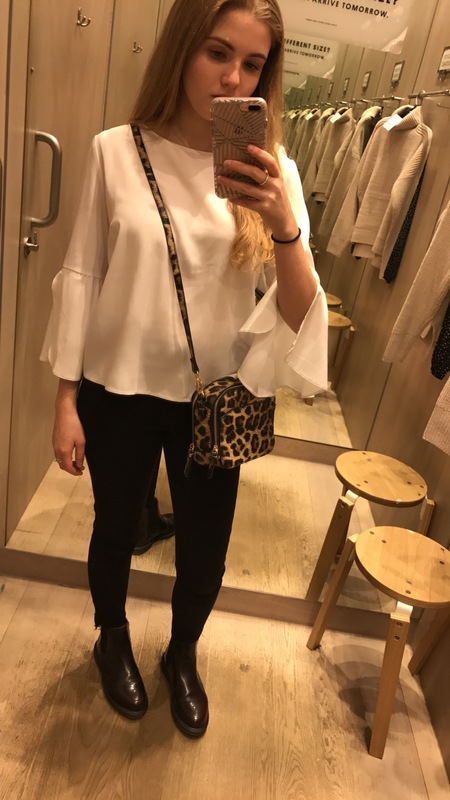 shirt with my Black Topshop Jamie Jeans, with my Flora boots and my Accessorise Leopard Print bag to jazz up the block colours. In the evening, me and Josh headed to the pub to meet his parents for a meal and a couple of drinks so I decided to throw on my new Zara Cardigan aka. 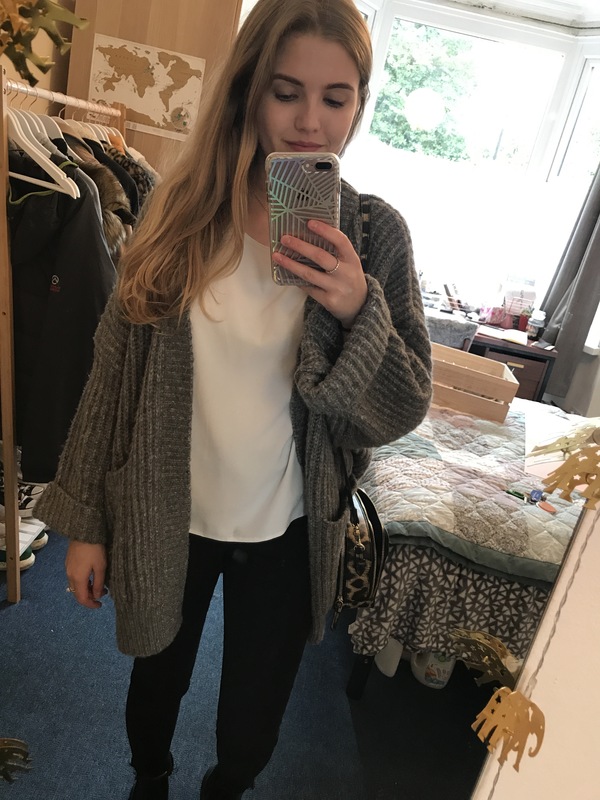 Cardigan of my dreams- so comfy. Thursday was a write-off because I wore my uniform all day at work and then got straight into my pjs when I got home so no outfit to be seen. However after work on Friday I threw on one of my new jumpers from Topshop which is nice heavyweight as it was freezing that night along with my ripped Topshop Leigh Jeans and again the Flora boots. 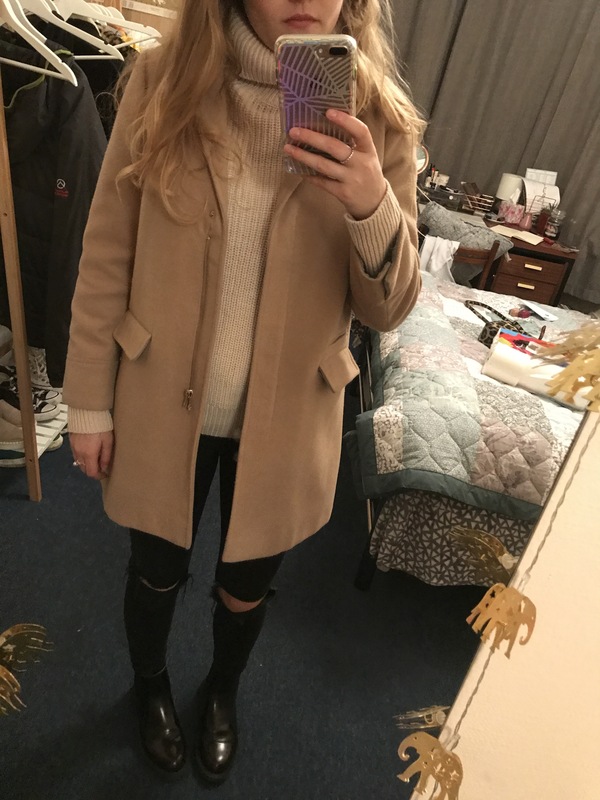 Myself and Amy then went for a late night Asda trip to find Autumnal bedding (bitterly disappointed there was none) so I just added my Topshop Camel Coat. 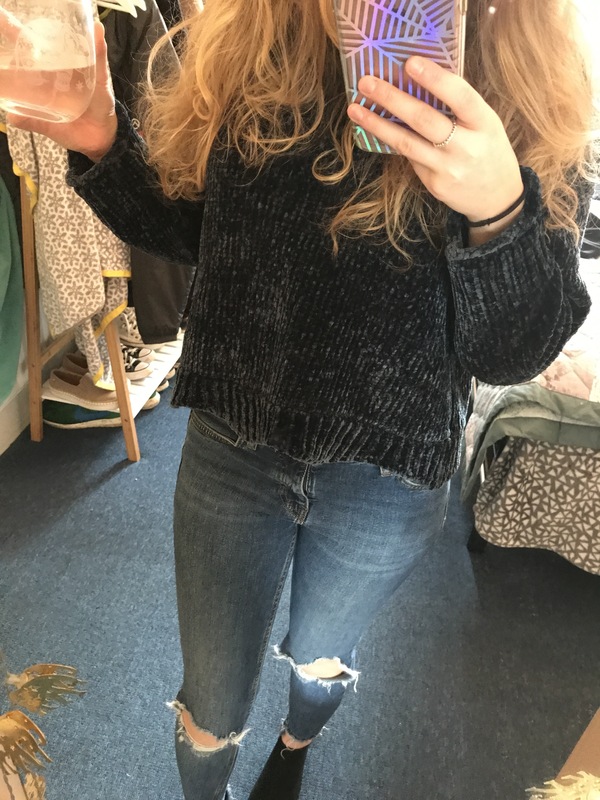 I had a lazy Saturday morning before work, taking blog photos, watching Youtube and eating, I wore my super soft Zara navy jumper- I have no idea how to describe the material, like shiny, velvety wool? Then I paired it with my New Look Jenna Jeans, nice and simple. 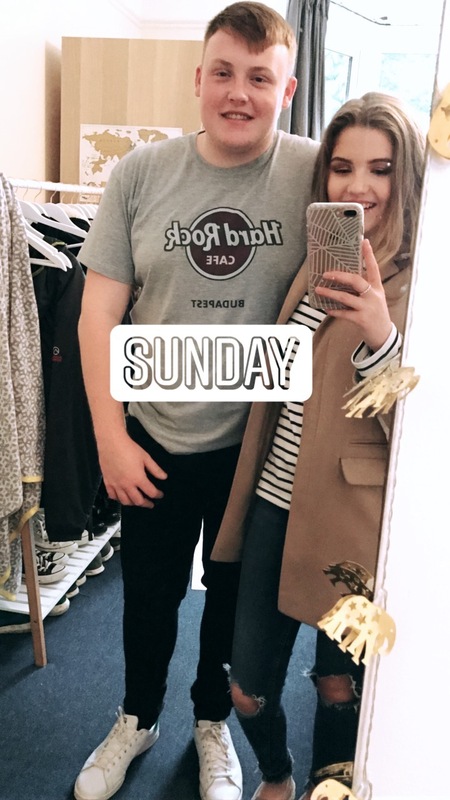 Me and Josh had a nice lazy Sunday morning before we headed out to the Garden Centre for a wander and a Chip Butty, I know we’re so cool. It was quite cool and rainy so I wore my Joules Striped heavyweight T-shirt, my Jenna Jeans and the Topshop Coat. I slipped on my River Island pumps as they are nice and comfy and I want to try and wear them as much a I can before the weather gets too cold. Hopefully this post has been of interest to you and has filled you in on what I’ve been up to this week as well as what I’ve been wearing. Let me know any feedback in the comments! Love those boots! They’re perfect for fall!